Oh, this was a juicy fantasy book! I went into this expecting it to focus on the action during the competition where the future empress has to beat four challenging rooms, but it was so much more than that. 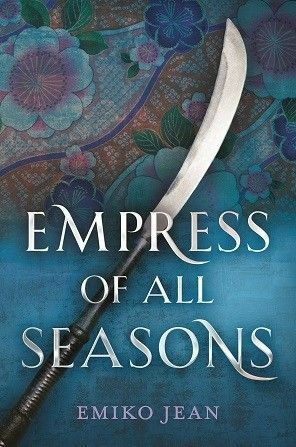 The world building in Empress of All Seasons was excellent and was truly the most gripping part of the book. I loved it. In this world, the yokai are enslaved by the emperor and some of them are fighting for their freedom. If you’ve been following my blog for a while, then you’ll know all about my obsession with slave rebellions and uprisings. This was a surprising part of the book for me, but it was such a good surprise. I also loved the stories about the gods and goddesses who were involved in creating the humans and the yokai and the rest of the world. I would definitely be up for more books or stories set in this world because the world building was fantastic. The main character, Mari, was a total BAMF, and she was lovely to read about. Her backstory was well developed, and her relationship with her mother was interesting and somewhat relatable, even for a fantasy book. I also adored her relationship with Amiko – even more in hindsight – because while he loved her, she turned him down, and they stayed best friends and he looked out for her. It was super lovely, and there was none of that Nice Guy rubbish cropping up and ruining everything. Platonic relationships FTW. I am a bit sad that this book is YA, because I feel it could have gotten a lot darker and been longer as an adult fantasy. I just wanted more. Empress of All Seasons is a wonderful debut, and it’ll be one that sticks in my mind when recommending YA fantasy to other readers. Oh this sounds awesome! I hadn’t actually heard of it before so thanks for bringing it to my attention. I don’t usually read fantasy but this review is making me want to pick this book up!